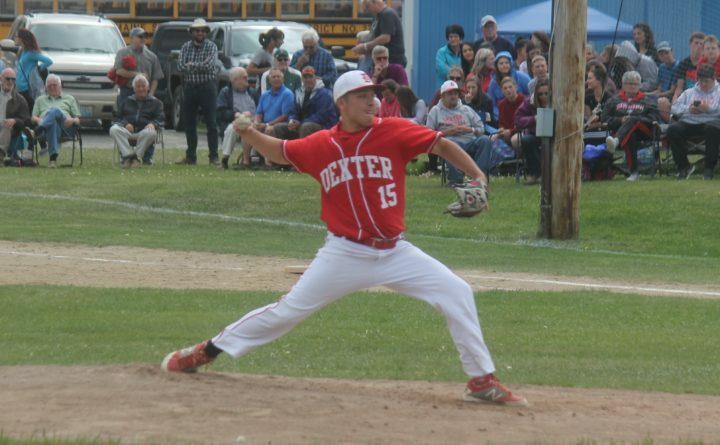 Dexter's Jacob Bickford delivers a pitch to a Fort Kent batter during a Class C North quarterfinal on June 7. Bickford has been named the PVC Player of the Year in Class C.
First Team — Matt Burnett, Ellsworth, Alden Fournier, MDI, Alex Applebee, Hermon, Keith Pomeroy, Hermon, Connor Wagstaff, Ellsworth, Matt Perconti, MDI, Ben Spear, John Bapst, Nick Avery, Old Town, Jackson Curtis, Ellsworth, Garrett Trask, Hermon. Pitcher of the Year: Matt Burnett, Ellsworth. Caribou: Kaytlin Waldemarson, Ellsworth: Katelynn Bagley, Emily Hart, Hannah Sargent, Mariah Young, Foxcroft: Jenna Clukey, Hermon: Kaitlyn Windsor, Laura Zenk, John Bapst: Meg Lander, Emilee Soucie, Old Town: Corinne Saucier, McKenna Smith, Olivia Westura, Morgan Love, Presque Isle: Kiara Lyford, Washington Acad. : Reese Thompson, Hailey Wood. Team: Gross: Bob Braun, Scott Henggeler, Mike Richardson, Jim Batey (67). Net: (tie) Lee Robinson, Lefty Homans, Bruce Grantham, Robb Brown, John Long, Lee Chick, Bill Farthing, John McNeal (57); Class A Gross: John Champeon (74), Bob Braun (78), Robert Berry (82), Paul Jaseinowski (82); Net: Mark Bennett (65), Neil Labbe (68), Paul Arsenault (73), Joel Greatorex (73); Class B Gross: Lee Chick (73), Jeff Dutch (78), Terry Whitney (80), Craig Miller (80); Net: Allen Staples (67), Brian Ashe (68), Larry Orcutt (71); Class C Gross: Larry Quinn (78), Barry Hobert (79), Colby Clendenning (80); Net: Bob Francis (64), Mike Wasilewski (65), Bill Haas (67), Fred Stocking (67), Greg McDaniel (67); Class D Gross: John Johnston (78), Joe Sala (79), Bill Kirby (80); Net: Tom Lane (65), John Long (68), Don Holmstrom (70); Class E Gross; Don Maxim (83), Bucky Owen (89): Net: David Davis (75), Charles Sargent (78), Don Means (78): Super Seniors Gross: Lefty Homans (93); Net: Allan McGown (80); Pins: No. 4 Lee Robinson 1-2, Paul Jewett 4-0; No. 7 Bob Berry 3-10, Mike Newell 5-6; No. 10 Dale Folnsbee 2-0, Mike Richardson 3-4; No. 13 Terry Theriault 4-1, Tom Bryant 4-4. Ladies League — Tammy’s Do Over: 1. Brenda Crosby, Lynn Hunt, Priscilla Aucoin, 35; 2. Sue St Heart, Sandy Meehan, Mary Ann Beatham 36.